This is my second helping of Help Us! Great Warrior, and I loved it just as much as my first look at it (issue #3) I am becoming an easy fan of this book. I feel like I am going to reiterate the entire review of #3 because all the same strengths are there. High stakes action/adventure quest superimposed over some of the cutest manga inspired art you have seen in a long while. The Warrior is a small, round little adventurer, who is very girly-girl in some aspects, and in others, extremely tough. The reveal from the end of #3 that carries over to this issue is a big one. It brings to light the origin of the warrior, and has potentially far reaching implications for the main characters. This issue was mostly action, but had a few light moments to it. I really enjoy the interplay of light heartedness with high action. I am drawn to that type of storytelling lately. I think it’s a good trend overall, and the perfect balm for the uber-serious tone of some other books. It helps to bring the fun back to comics, and Help Us! Great Warrior is pulling her own weight in that regard (and then some). The plot in this issue, while basically an ongoing plot that continues on into the next issue, revolves around opening a door to a demon dimension, while many innocent bystanders are demonically possessed. Like I said, the stakes are high. The warrior and her companions are not ones to shrink from the duty of protecting the villagers and the other innocent people, so they stand up to the Demon King. Where this is going will be resolved in future issues. Writing and art wise, I think Flores is a master at doing what she does. 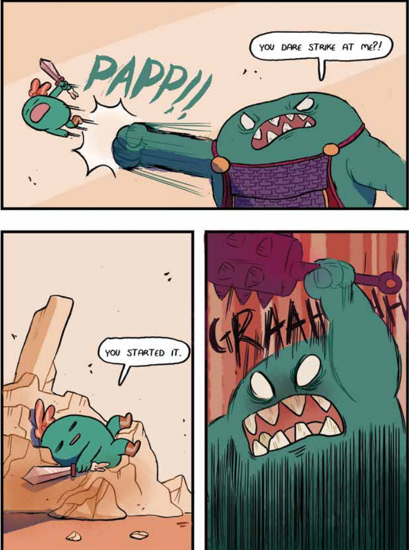 Trillian Gunn brings some also master level coloring to the table making this duo very skilled at making a comic that is fun to read, and fun to just look at. I seriously can’t wait for #5, and will be looking to pick up 1 and 2. This book has me hooked. Check it out; you just might get hooked as well. This entry was posted in BOOM Studios, Boom! Box, comic book review and tagged BOOM! Studios, Madeleine Flores, Save Us Great Warrior, Trillian Gunn. Bookmark the permalink.